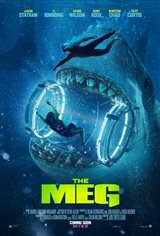 A deep-sea submersible is trapped with its crew at the bottom of the Pacific Ocean after being attacked by a prehistoric 75-foot-long shark known as the Megalodon. Chinese oceanographer (Winston Chao) recruits expert deep sea rescue diver Jonas Taylor (Jason Statham) to save the crew from this threat. There's just one problem — Taylor once escaped an attack by the same shark years earlier and now has to face his own fears in order to help the crew.